Carlone’s Florist is the quintessential provider of floral products and services in the greater Portsmouth and Newport, RI area, fulfilling the needs of families, businesses, and institutions for six decades. Our expert staff of floral designers offer clients the finest in original designs for every occasion and event. We have long established relationships with wedding planners, churches, caterers, banquet halls, hotels, photographers, funeral homes, and bridal boutiques. Our experienced staff works as a well-trained team to delivery your orders as promised, on time every time. From a simple bouquet for a significant other to a large wedding and reception, no order is too large or too small. We guarantee satisfaction. 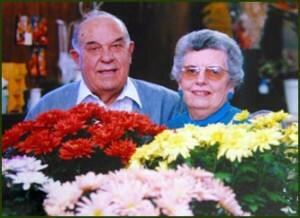 Peter and Margaret Carlone started Carlone’s florist in the cellar of their Portsmouth, Rhode Island home in November 1954. In 1957 they remodeled the garage and built a new store that continues to be the main location. For 44 years Pete and Peg ran a successful and award-winning business. Pete passed away in October 2000 and Peg is enjoying a well-deserved retirement. Their daughter, Carol Carlone has been working in the business since 1980. Her experience and detailed knowledge about the floral industry has helped the business grow over the years. In October 2004 Carol’s son Brian Weeks, joined Carlone’s florist as the 3rd generation. Together they opened a satellite store, Carlone’s Green End Florist, in Middletown, Rhode Island. For five years that store gained many new and loyal customers, while giving Brian the experience to follow in his family’s footsteps. Brian brings an innovative and modern style to the business. This helped him receive the Entrepreneur of the Year award in 2008 by the Newport County Chamber of Commerce. In October 2009 both stores consolidated back to the flagship location in Portsmouth where Carol and Brian continue to run the business. Carlone’s Florist has prided themselves on quality of products, attention to detail, and “whatever it takes” customer service. We are dedicated to continuing the same level of excellence that customers expect and have appreciated since 1954. National delivery through a network of trusted affiliate florists will bring any products offered on Carlone’s website to your loved ones throughout the country. Daily local delivery service by knowledgeable and experienced Carlone drivers is offered to Portsmouth, Middletown, Newport, Jamestown, Bristol, Warren, Barrington, Tiverton and Little Compton Rhode Island as well as to Fall River, Massachusetts and some parts of Westport, Swansea and Somerset MA. Call (401) 683-0304 for more information.